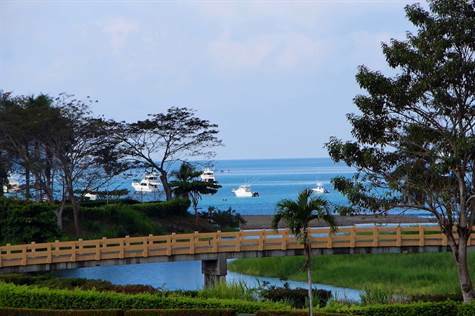 "OVERLOOKS THE 16TH HOLE OF LA IGUANA GOLF COURSE"
Best Views in the Del Mar community of Los Suenos! Larger corner unit that’s 2000 sq. ft. in size. Only 18 of the 84 residences in Del Mar feature this desirable 2000 sq. ft. floor plan. This outstanding 2nd floor residence is located in building number one, directly in front of the sixteenth hole of the Championship La Iguana Golf course with unobstructed views of both the ocean and golf course. It’s a corner unit with expansive wraparound terrace for outside dining or just relaxing and enjoying the ocean breezes. Plenty of room for BBQ's and outdoor entertaining. Master Suite occupies its own wing of the residence affording maximum privacy, with guest and family quarters separated. There’s plenty of room for all your toys with assigned covered parking for your car and golf cart, plus an exterior storage unit.